Uglyworld #218 - You Have To Try It, originally uploaded by www.bazpics.com. 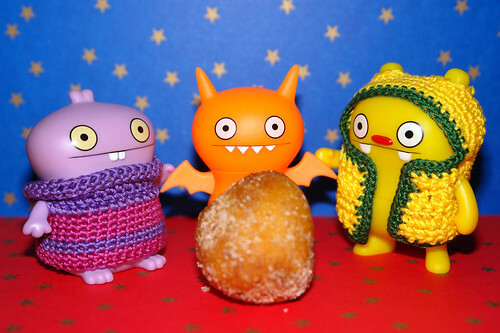 Babo and Jeero last night brought back a tasty treat for Orange Ice-Bat to try, some quarkbaelchen from the local bakery. Ice-Bat wasn't too convinced that it would taste nice and wondered if the pair were playing some kind of trick on him which would result in the little doughball blowing up in his face when he got close enough. It took quite some persuading by Babo and Jeero before he finally took a bite, and lets just say even my own one was eaten within a minute of this picture being taken!! !